This article will explain how to buy and sell bitcoins through different methods. It is important that you first understand what it means to own bitcoins, and how to store your bitcoins safely under your control before you buy your first bitcoins. If you haven’t done so already, go back and read article 2. How to store bitcoins, and 1. What is Bitcoin? before you read this one. The options available to buy bitcoins depends on what country you live, if you live in a larger city or not, and if you want to buy bitcoins using cash, bank transfer, or other payment methods. There are now a large number of exchanges for real-time trading between fiat currencies and bitcoin which serves a global customer base. A real-time currency exchange is a platform run by a company which allows individuals and businesses to hold accounts with fiat money and bitcoins from which they can trade with each other in a real-time market. To use these exchanges to buy bitcoins all you have to do is to register a free account on their webpage, with at least an email address, username and password. Some exchanges also require you to register your name and country of residence as a minimum. Depending on your trading volume you need to give additional personal identity information in order for the exchange to comply with Know Your Customer (KYC) and Anti-money laundering/Counter Terrorism Financing regulation (AML/CTF) that is required under the law where the exchange is registered, or in anticipation of coming regulation. To open up the ability to buy larger amounts of bitcoin you need to submit copies of documents to prove your identity (e.g. a passport or national ID card) and proof of your current residence (e.g. a Utility bill). In some jurisdictions the freedom of the exchange to do business is also hampered by government regulations specific for virtual currencies, such as the BitLicence in New York, which has caused several companies in the cryptocurrency space to leave New York and stop serving New York customers. You can often deposit money to your exchange account through several different ways, but the most common way is probably a direct transfer from a bank account registered in your name. Buying bitcoins on the large global exchanges is the easiest way to buy bitcoins to current market price (plus a 0.0 – 0.5 % transaction fee), but with the requirement to provide personal identity information if you want to trade any larger amounts. You should always use two-factor authentication on your accounts and never use the exchange as a storage place for your bitcoins, since you are not in control of the private keys to the bitcoins credited to your account. Here are some of the largest global currency exchanges and their main fiat currency trading pair. You can find the current price and 24h trading volume of the largest exchanges here. Localbitcoins.com is the largest platform for person-to-person bitcoin exchange in the world. You can think of it like eBay but only for buying and selling bitcoins. Localbitcoins has users in 248 countries and over 9,000 bitcoins are exchanged for local currencies through this plattform each week. It is easy to register an account on the site and create an advertisement for buying or selling bitcoins or click on other users buy or sell ads to initiate a trade. An ad can be for either any online payment method the seller of bitcoins want to accept, or it can be an ad for a local cash trade where you meet each other in person to settle the transaction. When you initiate a trade, the amount of bitcoins for the trade is withdrawn from the sellers localbitcoins wallet and held in escrow by localbitcoins. When the seller confirms receiving the payment from the buyer, the bitcoins held in escrow is released to the buyers localbitcoins wallet. How much other users on the site trust you for doing a trade depends on how old your account is, your trade history, your feedback from users you have done trades with, and how much identity information you have registered in your profile. The Mycelium bitcoin wallet for Android phones have a built in feature called Mycelium Local Trader. It is a decentralized in-person exchange service, where people who want to buy or sell bitcoins in-person can arrange trades with other people using the app. The app handles the trade between buyers and sellers, and calculate reputation ratings based on the trades. Here you find instructions for using the Mycelium Marketplace. A bitcoin ATM (Automatic Teller Machine), often called BTM (bitcoin ATM) is a machine for exchanging cash to bitcoins (one-way) and some BTMs also exchange bitcoin to cash (two-way). There are over 1800 BTMs installed in 56 countries throughout the world so far by about twenty different manufacturers. If you are lucky to have a BTM in your city it is probably the easiest ways to get some bitcoins. The webbpage Coin ATM Radar keeps track of the BTM development in the world with great maps, statistics/charts and information about all BTM manufacturers. In many larger cities in the world you can find local communities of bitcoin and cryptocurrency enthusiasts. Going to one of their regular meetups is a great way to meet new friends that can answer your questions and perhaps help you to acquire your first bitcoins. Some large cities also have regular events called “Satoshi Square”, where people gather to trade bitcoins with each other. Do a search for “Bitcoin” and “Satoshi Square” together with the name of your city on Meetup.com, Facebook and Google to find your local Bitcoin communities. Bitcoin banks are often not registered as banks under state regulation, so they are not officially allowed to be called banks, but they are called banks here because they want to act as custodians of your bitcoins. That means that they have full control over the bitcoins (private keys) you keep with them and you can not get your bitcoins out if the service goes offline. 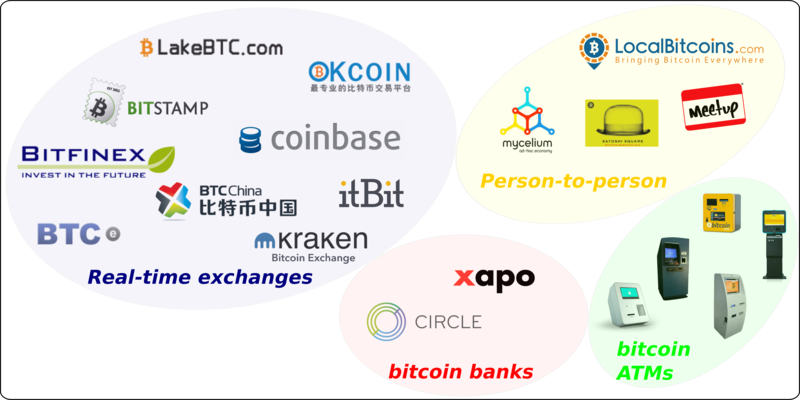 If you use one of these bitcoin banks to exchange fiat to bitcoin you should withdraw the bitcoins to a wallet under your control. Xapo offers insured cold storage and the option to exchange fiat for bitcoins using different options for a 1% fee. You can also order a debit card which makes it possible to spend the bitcoins in your Xapo account wherever VISA/MasterCard is accepted. Coinbase is a web wallet service that aims to be easy to use. It also provides an Android/iPhone web wallet app, merchant tools and integration with US bank accounts to buy and sell bitcoins. In this guide the aim has been to include some of the largest and most common options for buying bitcoins around the world. There are many more options available depending on which country you are in. There are also many other good guides to where you can buy bitcoins, such as here from Coindesk, and here from WeUseCoins. Educate yourself before you buy, don’t enter any information on untrusted websites (make sure you are on the correct website), and always use strong passwords and two-factor authentication on all your bitcoin exchange accounts.